Sueno theme echoes a flat design approach and a modern clean look perfect for creating an engaging blog. Its layout inspired by the latest trends underlines visual excellence of the theme without distracting from the content. Ideal for blogs that require alluring design. Consisting of a standard set of pages, the theme is centered around its blog section. 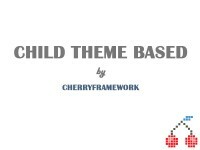 New release of Cherry Framework available for download. It's version 3.1.4 Below you can see list of Cherry Framework and Cherry Plugin updates and fixes.